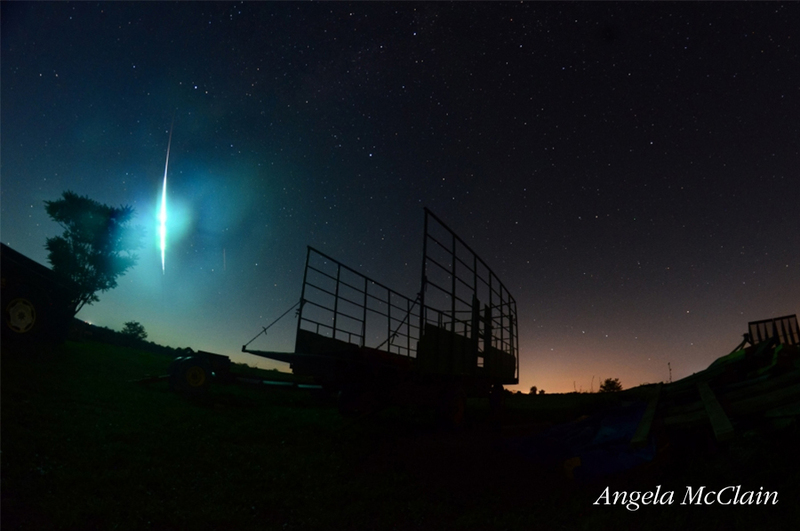 Here are two astonishings photos by Angela McClain of the Ohio Meteor (AMS Event #2132) this past Friday night. This event logged over 1000 witness reports and goes down as the 2nd most reported event in AMS history. 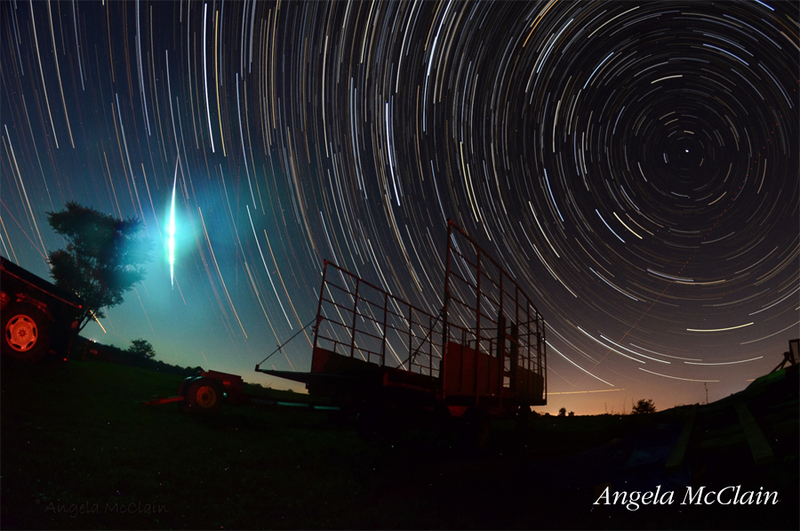 Here is another amazing photo by Alex Parlini of the same meteor. I was playing with my camera, that night, and had just had the shutter snap after being open for a few seconds; then saw what looked like a green flare or roman candle… fairly bright… I was southwest of Glasgow Ky, looking northeast… wish I’d waited 10 seconds before taking that last picture… ‘missed it by this much”! Columbus, Ohio — I just arrived home from a wedding rehearsal dinner and the sky lit up for approx. 1-2 seconds. It was very bright. I did not see the meteor, just the bright light and what appeared to be a vapor trail. My house obscured the view of the meteor. I’ve seen lots of meteor showers, but nothing on this scale. I immediately braked the bakkie to slow down and turned off the radio, hoping to hear any noise from the trail or as it crushed into the bush – nothing. I looked up in the sky and noticed there were no stars yet and it was exactly as the sun was setting. The skyline in the West was the usual orange colour and there was still a lot of light – in actual fact I was driving without my headlamps. I found this quite strange, I have never before sighted a shooting star this close and so early in the evening. I wondered if anyone else in the area had seen it. Being a scientist, I dismissed the sighting simply as an unusual shooting star. When I got home I told my story to my son who said I was day dreaming. I can assure you that I sometimes day dream about a lot of practical earthly things that are dear to me – but not about falling stars! I am also sane. Now that I am thinking of it – I am not the superstitious type, but could the passing away of my wife exactly 4 months ago – 125 days – have anything to do with it? By the way the star shot eastwards from almost above our farm, where my wife is buried. If so Why and if there is another interpretation what could it mean? Or is it the devil trying its best again? If the later – then may God through Jesus protect and make me and my family stronger. Mr. Myeni, firstly, my condolences on the recent passing of your wife. Many years ago I observed a large, bright fireball of some ten seconds duration here in the U.S. under just such conditions as you describe; in fact, it was only a half hour or so after sunset, with the sky still quite light and only the very brightest stars just becoming visible. While this meteor was later determined to have been several score of miles above the Earth’s surface during my observation, at the time it appeared to be leisurely traveling along at but a few hundreds of feet altitude. The suddenness and novelty of its appearance combined to produce the illusion of close proximity; I first thought it to be a large firework rocket of some sort, and it was only after a few seconds of its flight had passed that I recognized it as a meteor. Indeed, I had at that time been an amateur astronomer for well over a decade and had already witnessed many lesser fireballs, but no matter; the spectacle succeeded in initially deceiving me as to its true nature. As to whether or not the appearance you witnessed was related to your wife’s passing in some way, I cannot say, except to state that from your description of the object it would fit the description of a large meteor. Of course, God does indeed work on occasion through signs, and if He intended this as a sign for you I’m sure that He will reveal it to you in time; I would certainly recommend prayer if you remain uncertain as to this event’s origin. 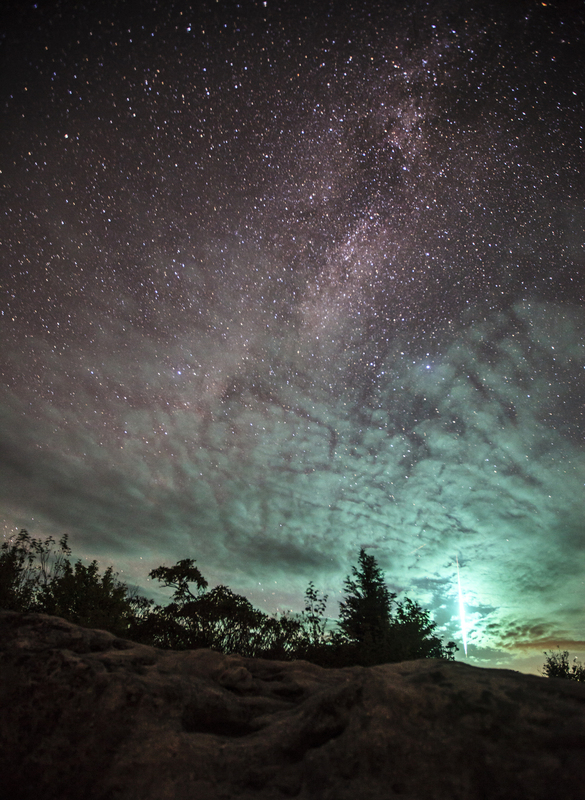 Northeast/Central Ohio – My girlfriend and I were heading home from a high school football game, and before i turned onto our gravel road, the entire sky lit up for about 2 seconds. I was confused and thought it was lightning, but it was cold out and a clear sky. Then thought something big just blew up in the distance. Then my girlfriend noticed a fuzzy streak in the sky and I knew right away it must have been a meteor. I see shooting stars all the time, but they don’t compare to how awesome this incident was! wish I knew it was going happen so I could have been ready for it and see the whole thing! We saw this streak from our car near Thomas, WV in norhern W.Va. Hands down is the brightest night sky event I’ve witnessed. has anyone heard anything further about the cause of the house fire in Pebbles OH? The last I heards was the fire marshall was trying to decide if it was caused by meteor fragments. My husband Jim McCoy works at Precision LLC. He works afternoons & was heading to his truck to come home. He was blessed to see this wonderful site! Work schedules differ for us & I have just heard of this. Thanks for the pictures! Does anyone know why the two fireballs i’ve seen over Ohio have both been green and long lasting? Green is a common color in bright fireballs. Most of the time this color is produced by the “exciting” of doubly-ionized oxygen atoms as the fireball passes through the upper atmosphere. Green can also indicate some of the composition of the object, most notably, copper and nickel. 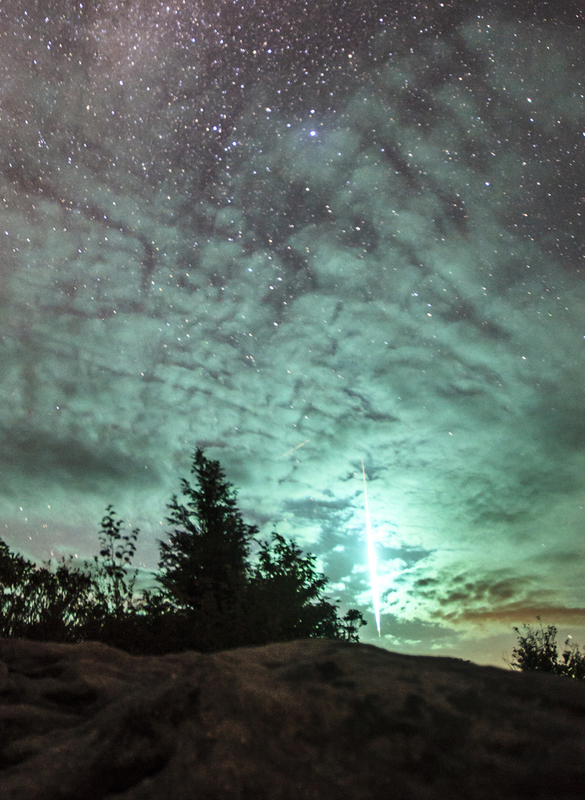 As for it being long lasting, meteors can strike the atmosphere at many angles. If it is moving in the same direction as the Earth then it will last much longer than those that hit the Earth from a head-on position. I live in Peebles Ohio. The State Fire Marshal still has not released a cause for the house fire. It was apparently hit by debris from the meteor. I saw the fireball. It was the brightest light I have ever saw. It is a common myth that meteorites are hot when they hit the ground. This is false as the atmosphere nearly stops them dead in their tracks and they end up free falling from at least 5 miles altitude. During this descent the air is very cold and the meteor loses all its heat. By the way, during their free fall meteors are also invisible as they have also lost the velocity necessary to produce light. Something else caused this fire.